Rack Power Distribution Units with Remote Access that Measure and Record Power Consumption and Environmental Conditions. The PX family of rack power distribution units (PDUs) enables network access for remote power management to reboot servers and network gear individually or as a selected group. 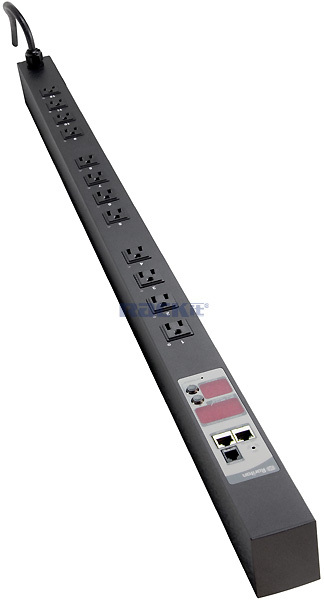 The PX intelligent PDUs family includes switched, non-switched, metered PDUs and inline meters. Use the PX's user interface to view power, temperature and humidity levels via Web browser, or via command-line (serial) interface, or receive SNMP-based alarms when conditions exceed defined thresholds. PX intelligent PDUs provide reliable power distribution for all the IT & network equipment in your data center combined with input current monitoring of the power loads on each circuit. Each metered rack PDU's LED digital display indicator provides an accurate, real-time reading of the aggregate power load in amps on each outlet or power circuit in the rack. Models are available supporting 110V, 208V, 220V, 400V, and 1- or 3-Phase circuits, designed for either vertical (Zero-U) or rack-mount (1U or 2U) mounting in the rack, with a large selection of outlet and plug styles. PX-5000 - Intelligent rack PDUs providing secure, rack-level and outlet-level remote power metering, monitoring and switching, plus plug-and-play environmental monitoring capabilities. PX-1000 - Intelligent rack PDUs providing secure, rack-level remote power metering and monitoring, plus plug-and-play environmental monitoring capabilities. PoC - Single Port Remote Power Control for Mission Critical Devices. Power on, off or cycle power to one connected device remotely via seamless integration with KVM over IP devices (PX-USB and IP Control). With a tiny footprint that's designed to be a seamless part of the standard power cord, PoC provides IT staff with complete out-of-band remote control to servers and network devices.